The town lies upon the slope of a gentle hill, of mingled slate and limestone, at whose foot a spring sends forth the first waters of the Paulinskill, the chief river of the county ... Some of the dwellings are very neat: the place has an air of business, and there is in fact a very considerable trade carried on with the surrounding country. In healthiness of situation, by the report of the inhabitants, it cannot be excelled. The buttons on the right go to a page about the subject depicted. Newton is centrally located in the Kittatinny valley, a broad limestone basin where slate ridges partition the waters of the Paulinskill, Pequest Creek and Wallkill. This old county town rests on the decline of the Great Slate Mountain, overlooking the Big Spring and Paulinskill meadows. A chain of Highlands, extending between the Delaware and Hudson Rivers, forms a barrier to tidewater markets along the valley’s southeastern rim. The steep escarpment of Blue Mountains, broken only at Culver’s Gap, paint the northwest horizon. The old Easton Road (Route #94) pursues the slope of the ridges along the valley’s main axis. It traverses the town along High and Water Streets. The New York Road (Route #206) rises from tidewater at Elizabeth and climbs through narrow gaps in the hills, passing Culver’s Gap en route to Milford, Pennsylvania, and ultimately, to the Great Lakes. It enters Newton on Main Street. Another ancient pathway crosses the village between Sparta and Swartswood Lake. For convenience of location, Sussex Court House stands at the hub of this spokewise network of roads, at an elevation of 648.68 feet above sea level. Deputy Surveyor Samuel Green divided the future site of Newton into adjacent tracts of land, varying in size between 1,250 and 5,000 acres, surveyed for William Penn, James Budd, John Bollen, and Amos Strettle, in October 1715. Some have mistakenly claimed that the village was named for the “new town” that sprang up after the first court house was built here in 1761-65. Actually, Newtown Township was formed in 1750 as a precinct of Morris County. The name was carried here by the Hunts and Pettits, pioneer families who originally settled in Newtown, Queens County, Long Island. Audio (mp3) Lecture given on May 8, 2011 by Kevin Wright at the Sussex County History Day event. 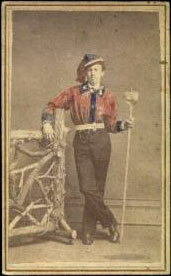 The subject was the Civil War in Sussex County. 33 MG, 30 minutes. From Devil's Island at the Big Spring, from the cool shade of Sheeprock and from stony terraces surrounding Big Brook and Grey Swamp, numerous clay shards and neolithic tools inform us that this place has been inhabited for several thousand years. But the old name of the place, of the stream and of its ancient people - Tockhockonetcong - has vanished from these hills. part of the Last Indian Purchase of the West Jersey Council of Proprietors. This tract came within the bounds of East Jersey when a Partition Line between the two divisions was surveyed by John Lawrence in 1743. Several paths leading from the ancient Indian towns at Minisink toward tidewater or toward the Forks of the Delaware entwined in this neighborhood. In the hollow occupied by Big Brook, where the path divides, one branch to Swartswood Lake and another to Culver’s Cap, a German named Henry Harelocker raised his log dwelling in 1751. For convenience of location, Governor Josiah Hardy established the seat of Sussex County on or within a half-mile of Harelocker's plantation in Newton Township on December 12, 1761. Jonathan Hampton, owner, deeded land for Sussex Courthouse at the intersection of the road from Easton to Newburgh with the road from Elizabethtown to Minisink. Judge Hampton also surveyed a Town Plot including lots for a parsonage, academy, meeting-house, public green and burial ground. Houses, taverns, shops and offices soon sprouted. During the Revolution, Newton was strategically placed along an intermountain line of supply and communication between New England, the Hudson River forts and Philadelphia. At the hub of a spokewise network of turnpikes and post roads, the village grew into a regional center for county banks and newspapers, mail and freight distribution, commerce, education, mechanical trades and social gatherings. In 1814, the Conover Town Lots were surveyed around streets named for Presidents Washington, Adams, Jefferson and Madison. Mechanic Street (soon named Liberty Street) provided fashionable hillside properties as part of the development of Johnson's Meadow Lots. Leather and wood working were the largest industries. David Kerr manufactured hats on Church Street between 1815 and 1832 when he was succeeded by Stephen Day. To protect a growing community, Newton Fire Company was organized December 19, 1835. Stage hotels prospered and a commodious brick hostelry was built by Dennis Cochran in 1843. The present Classical Revival Courthouse was built upon the charred ruins of its predecessor in 1847. 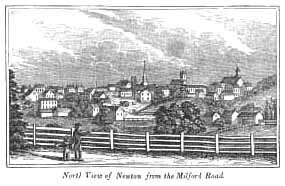 Completion of the Sussex Railroad to Newton in December 1854 greatly accelerated the community's growth. Freight wagons laden with pork and butter rumbled through the village along the road to the Big Spring and the new depot. Large brick emporiums and commodious hotels accommodated the surge in trade. New streets such as Halsted (1857) and Trinity (1857) filled with residences in the latest style. Coal, supplied by rail, stoked steam-powered mills and foundries. Boom times fueled by Civil War provided commodious new churches, a bank, a jail, an elegant Library Hall, a large public school, and a passenger station. Acquiring a distinct identity, the village departed Newton Township and incorporated as a town on March 10, 1864. Building-lots on West End Avenue and the Johnsonburg Road, Clinton Street, Elm Street, Maple Avenue and Townsend Street were opened in 1869. Lawnwood and Railroad Avenues opened in 1870. The Sussex Railroad was extended beyond Newton to Branchville (1866-69), to Franklin (1871), to Hamburg and McAfee (1872). The citizens of Newton subscribed $25,000 to build the mainline of the railroad across the Meadows to Warbasse Junction. The Delaware, Lackawanna & Western purchased the Sussex Railroad in 1881. Concerned by competition from new railroads, Newton tradesmen induced Henry W. Merriam, a prominent New York shoe manufacturer, to occupy a new brick factory on the Sparta Road in 1873. Success of the modern factory system spawned a prosperous Age of Enterprise. New industries included: the Sussex Shoe Company on Mill Street in 1886; the Sterling Silk Company on Sparta Avenue in 1896; the Newton Shoe Company on East Clinton Street in 1897; the manufacture of photographic paper and lens by Gustave Gennert in 1900; the Century Milk Company's creamery on Stuart and Trinity Streets in 1901; Martin Ward's floral business on Foster Street in 1901; the Mellor towel factory in the Broda building on Water STreet in 1907; and Mazuy Mills on Clinton and Mill Streets in 1919. The mechanical ingenuity of the age is evident in scroll-sawn woodwork, turned balustrades, plate-glass storefronts, slate shingles and skilled masonry. Bankers, manufacturers, lawyers, and shopkeepers scanned pattern-books and engaged architects to create fashionable mansions. Wage-earners leased comfortable cottages within call of the factory whistles. Morris & Frace opened three new streets near the Merriam shoe factory in 1890. Stuart and Hampton Streets were opened in the same year. New developments sprouted in South Newton, Highland Park and Morningside Park. A public electric plant (1894), municipal water supply (1896) and sewerage treatment (1907) added to the safety and convenience of town-life. The age of department stores opened with the Park Block in March 1897. In consequence of the Sussex County Sesquicentennial, the Sussex County Historical Society was organized in 1904. After World War I, the United States stood foremost among the industrial powers. Opening of the Hudson River crossings and development of a State Highway system gave rise to suburban sprawl. Soon dealerships, fuel stations, garages, tract housing and paved roads were built in Newton to service an automotive culture. The first traffic lights were installed in 1926. The high-rolling Roaring Twenties were embodied in construction of impressive Neoclassical homes for banks, moviehouses, printing plants and a telephone exchange. A High School opened on Halsted Heights in 1920. Beginning in 1925, Brookside Park Development spread over Hillside Terrace, Ferndale, Sunset, Lake and Park Avenues. On March 31, 1927, 1,100 acres comprising the Voorhees and Mason tracts were annexed to Newton from Andover Township to accommodate the construction of homes on Newton Terrace, Mason Avenue, Sussex Street and Merriam Avenue by the Newton Development Corporation. In 1929, the United Telephone Company acquired the Sussex Telephone Company and constructed a modern Telephone Exchange on Adams Street. The Great Depression brought a litany of business failures, plant closings and mortgage foreclosures. Despite hard times, Newtonians prided themselves on opening Newton Memorial Hospital in 1932, a Woolworth's Department Store in 1935, a Motor Vehicle Inspection Station and Town Garage in 1937, and the Dennis Library in 1939. The Salesians inaugurated Don Bosco Seminary in 1931. Mazuy Mills merged with Darlington Fabrics in 1932. Sussex County led New Jersey in the number of dairy cows between 1850 and 1950, boasting of "More Cows Than People." After World War II, Newton remained the hub of a rural hinterland dotted by red barns and white silos. Newly wed veterans and their young families created a demand for housing and services. The first parking meters were installed in 1948. An expansive high school on Ryerson Avenue and a parochial grammar school on Jefferson Street were built in 1953. In 1956, the form of municipal government changed to a bipartisan council and town manager. Library Hall fell in 1958 to make way for a new post office. A department store was built upon the grave of the venerable Cochran House in 1961. Merriam Avenue School was built in 1964. As perhaps the greatest indicator of change, rail service was abandoned in 1966 and dependent creameries closed. Interstate Route 80 was built between 1959 and 1973, slowly transforming the area into a "bedroom community." Garden apartments were built to accommodate the demand for affordable housing. Rows of residences were felled to create central parking-lots around the commercial district. Beginning in 1974, antique streetscapes and memorable landmarks vanished in a wave of federally subsidized urban "renewal." In their stead, high-rise public housing and a vacant commercial crater appeared opposite the landmark Court House. Amidst bland suburbia and its commuter congested highways, Newton yet affords a sociability, charm and convenience long associated with village life. Appreciation of this fact is evident in a new wave of town-building: conversion of the Merriam factory ot condominium residences, construction of Cochran Plaza on Spring Street, construction of a new judicial complex behind High Street and location of Sussex County Community College on the Don Bosco Campus. An important component of this renaissance is creation of a Core Historic District and a Preservation Advisory Commission to protect the architectural integrity and variety of our community from further erosion. This website is a record of my personal interest in Sussex County. Book Order Form: Click here or more info. 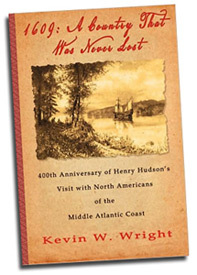 Mining contemporary sources, historian Kevin W. Wright has carefully reconstructed the native world that Henry Hudson encountered during his fateful voyage of 1609. In so doing, he dispels the fog of nineteenth and twentieth century myths to rediscover the North Americans of the Middle Atlantic Coast. Describing their original homelands and culture in great detail, he brings the panorama of culturally diverse native societies to life. These were truly the First Americans, inclined to live “almost all equally free.” Could their natural democracy lie at the heart of the American spirit?